Here’s a low-salt recipe made for the simple ‘flip style’ cooking of the Florida Keys. 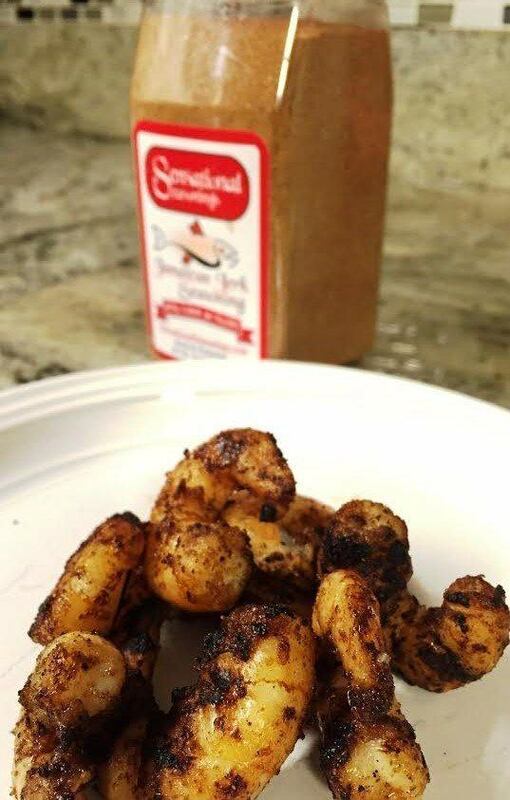 This is uniquely named “Pining for Key West Jerked Shrimp” and was developed by one of our original product testers who happens to be a ‘grill master’. This quick and healthy recipe offers great flavor by using one of our low sodium seasonings – Jamaican Jerk Seasoning. Just fire up the grill, turn on some Jimmy Buffett and get ready for some great island flavors. Our goal at Sensational Seasonings is to share healthy recipes that allow you to quickly prepare meals at home that taste as good as your favorite restaurant. We think this one fits the bill! This is also a perfect recipe for those on a low-salt diet. To avoid added salt altogether, prepare this recipe using Sensational Seasonings Pork Rub, for a salt-free meal. 1. Place your peeled shrimp in a plastic container or bag and add olive oil and Jamaican Jerk Seasoning. 2. Shake to coat the shrimp evenly and refrigerate for 30 minutes. 3. 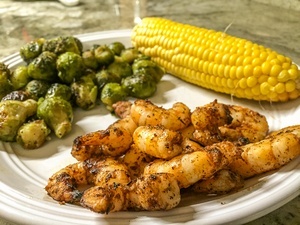 Take your grill temperature high (400°F) and grill shrimp one minute on each side, taking care not to overcook. See pictures below of perfectly grilled shrimp. Note: If shrimp are not peeled, then grill shrimp for an extra minute on each side. Simply plate up with vegetables or serve them in a taco with mango salsa! 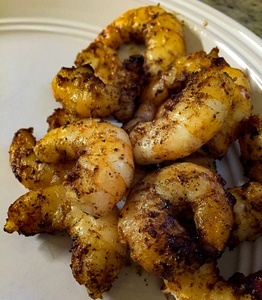 For added flavor and a little more heat, lightly dust shrimp with another coating of Jamaican Jerk Seasoning after grilling. Sensational Seasonings is a gourmet seasonings company located in Johnson City, TN. Our healthy and delicious product line includes: Cajun Blackening Seasoning, Chicken Seasoning, Jamaican Jerk Seasoning, Italian Seasoning and Pork Rub. Each of our seasoning blends is either salt-free or low-salt (meeting all guidelines of the FDA). Reducing the salt content in our seasonings allows you to get more flavor from all the herbs and spices we include, while allowing you take total control of your salt intake.